in Yorkshire. With more than 30 years’ experience in the legal industry, Ann has been qualified as a family solicitor for 21 years, and will be based in the firm’s Ilkley office. 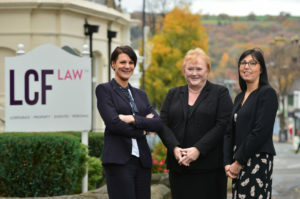 Sue Butterill (pictured left), a Chartered Fellow of Legal Executives has also joined the team, Sue has worked in the legal industry for 22 years helping clients who are separating as well as those who have suffered domestic abuse. She will support Ann, Bradford-based family expert Harjit Rait, and head of family law, Rachel Spencer Robb. Rachel (pictured right) said: “Operating across Leeds, Bradford, Harrogate and Ilkley, we feel we have first class experience and expertise to offer our clients who are going through extremely stressful situations. We offer trusted professional advice, highly specific to their circumstances.